Ask lovers of true-crime sensation who Phil Spector is, and they'll say he's the dotty old recluse who killed actress Lana Clarkson in his Alhambra, Cal., mansion in 2003. Vikram Jayanti's BBC documentary The Agony and the Ecstasy of Phil Spector, now receiving a theatrical run at New York City's Film Forum, shows some grim details from the first of Spector's two trials  forensics of Clarkson's wounds, testimony by two other women that he had put guns to their heads  plus the defendant's bizarre coiffure: the wild Isro wig he wore, he says, in part as "a tribute to Albert Einstein and Beethoven," whom Spector considered his artistic equals. About the wig, he recalls, "Jay Leno said I looked like I'd been electrocuted already." After all the comic weirdness, and two trials, Spector was convicted in 2009 of second-degree murder and sentenced to 19 years to life. The documentary annotates its exclusive, rambling Spector interview (blond wig this time) with hagiographic notes by Mick Brown, author of the excellent biography Tearing Down the Wall of Sound: The Rise and Fall of Phil Spector. And over the footage from the trial, Jayanti plays the music that Spector birthed: girl-group anthems like "Uptown," "He's a Rebel," "Da Doo Ron Ron" and "Be My Baby." To those who grew up in the early '60s, Spector was the record producer, himself just out of his teens, who monitored adolescent heartbeats and transformed them into pounding rock 'n roll dreams. He produced and cowrote the grown-up ballads "You've Lost That Lovin' Feelin'" and "River Deep  Mountain High," which still stand as two of the decade's great singles. Then the Beatles hired Spector to make an album out of the tracks that became Let It Be; he also produced John Lennon's Imagine album and George Harrison's "My Sweet Lord." For Spector's impact on the intelligentsia, you could consult Tom Stoppard's The Real Thing, the 1982 play about a playwright lost in '60s pop nostalgia. Henry, the hero and Stoppard stand-in, proclaims that, while he was dashing off his highminded dramas, "I was spending the whole time listening to the Crystals singing 'Da Doo Ron Ron'" and "believing that the Righteous Brothers' recording of 'You've Lost That Lovin' Feelin'' on the London label was possibly the most haunting, the most deeply moving noise ever produced by the human spirit." Those were both Spector singles  what the producer called his "little symphonies for the kids." 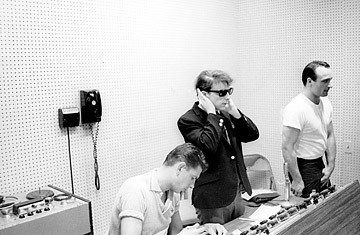 The esteem in which Lennon and Harrison, the Beach Boys' Brian Wilson and most of Spector's other contemporaries held him  Lennon's son Sean called him "the genius that the geniuses come to"  is exceeded only by Spector's opinion of himself. Just as movie directors wanted to be known as auteurs, Spector believed in the sanctity of his calling and the grandeur of his achievement. "I was creating the sound in the same way Modigliani or DaVinci or Michelangelo was creating art," he says in the film. "And I always considered it not rock 'n roll; I always considered it art." What exactly was the art? Not the song. Though most of his hit singles were composed by three gifted songwriting duos  the husband-wife teams of Gerry Goffin and Carole King, Barry Mann and Cynthia Weil and Jeff Barry and Ellie Greenwich, all in their early 20s  Spector would revamp their work to his satisfaction (and take a writing credit), then fill the B sides of his singles with instrumental vamps named after his studio musicians ("Tedesco and Pitman," "Nino [Tempo] and Sonny [Bono]." Nor did Spector see his brand of rock 'n roll as a singer's medium. He cavalierly shuffled the lineups of his girl groups and sometimes left them off their own records; on "He's a Rebel," credited to the Crystals, the real singers are Darlene Love and the Blossoms. No: as Spector tells Jayanti, "The production always carried the art." The Real Thing's Henry is saying as much when he insists, "I don't like artists. I like singles." That expresses a core truth of Spector rock 'n roll; that the sound trumps melody or vocal virtuosity. It creates the feeling. And Spector created the sound. He could take an Oscar-winning nonsense song like "Zip-a-Dee-Doo-Dah" (for Bob B. Soxx & the Blue Jeans), a schmaltz ballad like "Unchained Melody" (the Righteous Brothers) or an entire album of Christmas pop, and invest it with bounce, grit and that you-can't-sit-downable Spector swing. Though he also compares himself to Bach, he was really the Toscanini of pop. Spector's "Wall of Sound" was a fuzzy, congested, massive sonic assault that was perfect for monaural 45 record players and AM car radios. To his cramped, beloved Gold Star studio in L.A., Spector and super-arranger Jack Nitzsche would summon an army of musicians  backup singers, guitarists, a few horn men, percussionists with their castanets, maracas and tambourines, plus three or four pianists banging away simultaneously and maybe a string section  for long nights and 40 or 60 takes, while engineer Larry Levine would double the echo effect and Spector kept noodling and cajoling until he heard the magic that was already in his head. By the time he was done, the song exploded with a sound so dense and intense that a record needle would literally jump out of the grooves. Spector's target audience got the same vinyl jolt. Even today, it's impossible to listen to "Da Doo Ron Ron," "Be My Baby," "He's a Rebel," "Then He Kissed Me" or "Not Too Young to Get Married" without feeling elated, intoxicated and 15.